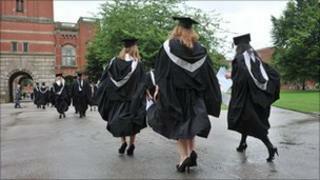 The introduction of a graduate tax would undermine the competitiveness of the UK economy, say business leaders. The Institute of Directors says firms would shoulder the burden as graduates expect higher salaries to compensate for what would lose through taxation. It also claims a graduate tax would lead to a "brain drain" by encouraging the most able students to study and work abroad. Lord Browne's review of student finance in England is due to report in October. The National Union of Students rejected the attacks on a graduate tax as "baseless scaremongering". The funding review is considering options such as raising tuition fees, which are paid back by students after they graduate, or introducing a form of graduate tax paid by graduates to the Treasury through their salary. The IoD report says the coalition government "finds itself perched atop the horns of a particularly prickly dilemma" in having to decide how to reform higher education funding. In part this is because the Liberal Democrats have pledged to phase out tuition fees. Lib Dem Business Secretary Vince Cable has appeared to be more enthusiastic about a graduate tax than his Conservative universities minister, David Willetts. The IoD report says under an open-ended system, a graduate tax becomes the student loan you never pay off and would be "a tax on effort and merit". It argues the link would be broken between the course cost and repayment, and between students and their institutions. "The more diligently a student spent his or her time at university, and the more effectively he or she laid the foundations for a successful and well-remunerated career, the more they would ultimately contribute towards the cost of their studies," it says. The IoD argues that a graduate tax would place an extra burden on employers because graduates would expect higher wages to compensate. "It might seem to be fair enough to charge employers for the benefit of having highly-educated employees. "But to the extent that education is commercially worthwhile, that is already reflected in higher salaries," it adds. Employers are already paying more for valuable graduates, it says, but this system would mean they had to pay even more. The report also argues that the benefits of the extra income would take some time to come on stream. It adds that as universities funding is likely to be cut further in the Comprehensive Spending Review, this would leave the government with a "severe headache about how to plug the gap in the meantime". The head of the IoD, Miles Templeman, said: "Introducing a graduate tax would be extremely impractical for reasons that we and others have set out, but what has been lost in the debate so far is the negative impact a graduate tax would have on the UK's tax competitiveness. "It makes no sense to create a funding model that encourages a brain drain, puts new cost burdens on employers and financially penalises students who work hard at university and demonstrate merit." Aaron Porter, president of the National Union of Students, rejected the criticisms of a graduate tax - which the union supports. "The unsupported assertion that a graduate tax would cause a brain drain is the last resort of those who are losing the argument. To raise the prospect of an exodus from the UK is baseless scaremongering," he said. "It is now widely accepted that a sophisticated graduate tax would relieve the lopsided and unfair burden of tuition fees on young people. No organisation has in all seriousness advocated the straw men the IoD have constructed, leading to a wrong headed attack that adds nothing to the debate." A spokesman for the Department for Business Innovation and Skills said the government had asked Lord Browne to look at a variable graduate contribution amongst other options as part of his review of university funding. He added: "We need a new funding settlement which promotes world class competitiveness in teaching and research, with better quality for students."